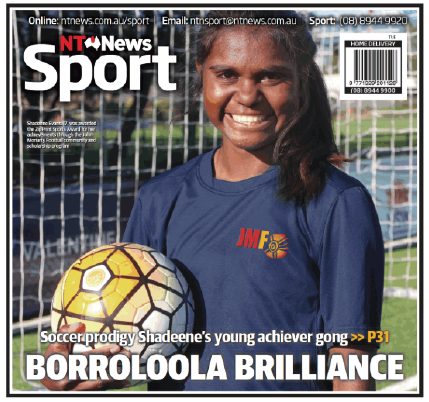 91%of 6-16 year olds in Borroloola participate in the John Moriarty Football Program! 30% of our 12-14 year olds have been selected for representative teams! 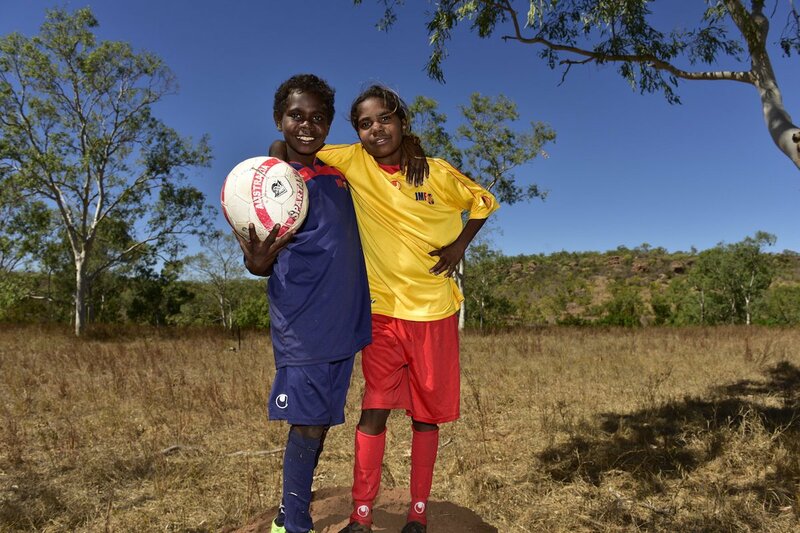 John Moriarty Football is a renowned best practice program for 2-16 year old boys and girls in remote Australia. The unique organisation was founded by the first Indigenous player selected for Australia, John Moriarty, and his son James. At JMF, we bring children together through sport, promoting good health and wellbeing in some of the country’s most remote regions. We support our talented young athletes to thrive and reach for their true potential to succeed at local, national and international levels of the game. IFW18 aims to drive a social conversation about the current state of play of Indigenous representation in football, and how to improve it. The theme is Football Dreaming – Indigenous inclusion and a shared Australian future through football. The focus is on women’s football and JMF scholarship holders will be attending W-League and Matildas games. #JMF18 is supported by Football Federation Australia, Professional Footballers Australia, SBS, NITV and Fox Sports. Share your thoughts, opinions and stories on social media using the hashtags #JMF18 #FootballDreaming and follow @JohnMoriartyFootball on Twitter and Facebook. John Moriarty AM is Chairman and co-founder of Balarinji, Moriarty Foundation and of John Moriarty Football. John Moriarty began his soccer career with South Australian First Division teams Port Thistle, moving on to Port Adelaide, and to Adelaide Croatia for a summer season, before playing for Adelaide Juventus. Moriarty represented South Australia seventeen times. John is the recipient of the Member of the Order of Australia (AM), the St Peters Citizenship Award, and the Advance Australia Award for Service to Industry and Commerce. John’s autobiography, Saltwater Fella, was published by Penguin Books in 2000, and was Highly Commended in the Australian Human Rights Commission Literary Awards. In 2014 John was inducted into the Australian Design Hall of Fame, and in 2015 was inducted into the Football Federation of Australia Hall of Fame. Ros Moriarty is Managing Director of Balarinji, a leading Australian strategy and design practice established in 1983 and Co-Founder and Managing Director of the not-for-profit Moriarty Foundation launched in 2012. Moriarty Foundation delivers remote region early literacy and children’s football (soccer) amongst Australia’s most vulnerable children. Ros is the author of the acclaimed memoir Listening to Country, Allen & Unwin 2010, shortlisted for The Age 2010 Book of the Year, and winner, NT Year of Reading 2012. She has also written four picture books for children, Kangaroos Hop, Ten Scared Fish, (2012) Summer Rain, and Splosh for the Billabong, (2015) all published by Allen & Unwin, all shortlisted for the Speech Pathology Australia Book of the Year Award (2012 & 2015), and Kangaroos Hop for the 2013 Australian Environment Awards for Children’s Literature. Ros Moriarty is the winner of the Business and Enterprise Category of the Australia’s 100 Women of Influence Award 2015, she was inducted into the Australian Businesswomen’s Hall of Fame in 1999, and in 2012 was a finalist in the NSW Telstra Business Women’s Awards in the Business Owner category. In 2013 Ros, and her husband and co-founder of Balarinji and Moriarty Foundation, Yanyuwa man John Moriarty, were inducted into the Design Institute of Australia Hall of Fame. Professor Rosita Henry is an anthropologist in the College of Arts, Society & Education, and a Research Fellow in The Cairns Institute, James Cook University. Rosita has a PhD from James Cook University, and has been employed as an academic at the University since 1992. She is a Fellow of Australian Anthropological Society and a Fellow of the Australian Institute of Aboriginal and Torres Strait Islander Studies (AIATSIS). She is a member of the World Anthropological Union and the elected Chair of the Ethics Taskforce of the World Council of Anthropological Associations (WCAA). Her research concerns relationships between people and places across Australia and the Pacific as expressed through cultural festivals, the politics of public performances, cultural heritage, material culture, land tenure conflict and the relationship between Indigenous peoples and the state. Professor Henry is author of the book Performing Place, Practicing Memory: Indigenous Australians, Hippies and the State (Oxford and New York: Berghahn Books, 2012) and co-editor of the book The Challenge of Indigenous Peoples: Spectacle or Politics? (Oxford: Bardwell Press 2011). Her most recent publications are the product of an ARC Discovery Project on ‘Objects of possession: artefact transactions in the Wet Tropics of North Queensland’. In this regard, she has co-edited the volume Transactions and Transformations: Artefacts of the Wet Tropics, North Queensland (Memoirs of the Queensland Museum (Culture) Volume 10, December 2016). Northern Territory Educator, former Principal of St Francis Xavier School, Nauiyu, Daly River; made a Member of the Order of Australia for services to Aboriginal education and art; founder of the Miriam-Rose Foundation, empowering Indigenous youth. Miriam-Rose Ungunmerr-Baumann (AO) is an Aboriginal elder from Nauiyu (Daly River), where she served for many years as the principal of the local Catholic primary school. She is a renowned artist, writer and public speaker. Craig Foster is one of Australia’s most recognised and respected football personalities, analysts, commentators and authors. Craig is a true champion of the game, and well known for his generous support of grassroots youth football. Craig brings his passion, knowledge and extensive national and international experience and networks to the Moriarty Foundation board. Fellow of the Institute of Chartered Accountants. Board Member and Treasurer of NFP SciWorld Inc.
Richard gives his time to community organisations. In addition to his involvement as a board member with the Moriarty Foundation he is Board Member and Treasurer of SciWorld Inc, a not-for-profit DGR with the object of promoting public science facility’s with interactive exhibitions to provide science and technology experiences for South Australian children and their families. Richard is also a Committee Member and Treasurer of the International Piano Series Incorporated. Tim Cahill is a professional footballer for Melbourne City FC and the Socceroos. Tim’s playing career has taken him from the Premier League in the UK to America, China and now back home in the A-League with Melbourne City FC. He has played in 3 World Cups with the Socceroos and was part of the team that won the 2015 Asian Cup. Off the pitch, Tim is heavily involved with grassroots football and provides a free academy to thousands of Australian kids. Moya Dodd is a former Australian Matilda’s Vice-Captain, and in 2009 was the first woman elected to the Asian Football Confederation, serving as Vice-President, Chair of its women’s committee, and Deputy Chair of its legal committee. A Partner in one of Australia’s premier law firms, Gilbert + Tobin, Moya is currently a Director of Football Australia, and a member of FIFA’s legal committee. Moya brings to John Moriarty Football her wealth of experience in business, law and international football, and a particular passion to support girls and women to succeed at all levels of the game. Andy Harper is an Australian football legend whose playing career was forged in the National Soccer League (NSL) for teams including Sydney City, St George, Marconi, Brisbane Strikers and the Newcastle Breakers. The inaugural Chief Executive of Sydney FC, Andy is now well known as a host, presenter and big game commentator on Fox Sports Football. The best known of a number of books written by Andy is Sheilas, Wogs and Poofters, the biography of the late, great Johnny Warren. Andy is passionate about Indigenous football and the difference John Moriarty Football can make to the game in Australia. To create the chance for change amongst Aboriginal children in remote communities.